About Dürer's greatest German contemporary, we know . . . neither the date of his birth (he died in 1528, the same year as Dürer) nor, until the present century, his real name. He was unaccountably listed as Matthias Grünewald by the German writer Joachim von Sandrart in the seventeenth century, and the misnomer stands through long usage. . . . His actual surnames were Gothardt and Neithardt. . . . The leading humanist Melanchthon, three years after the artist's death, ranked him second only to Dürer among German masters. He may have been born in Würzberg, and worked for a while in Aschaffenburg. He was also an architect and hydraulic engineer, and remained for many years in the service of the prince-bishop of Mainz, one of seven electors of the Holy Roman Empire. He never went to Italy. Unlike the aristocratic Dürer, Grünewald was implicated in the Peasants' War, and had to flee to Halle in Saxony, where he died. Since few of the early documents, listing only a certain Master Mathis, can be securely connected with him, guesses concerning his birthdate range from 1455-83. But since the unquestioned dated pictures are all within the sixteenth century, the latter date is probably acceptable. Grünewald's greatest work is the Isenheim Altarpiece, probably begun in 1512 and finished in 1515 for the church of the Hospital of Saint Anthony in the Alsatian hamlet of Isenheim near Colmar. . . . It is a creation of such shocking intensity that many are repelled by it, yet the central Crucifixion (see centerfold) is one of the most impressive and profound images of the culminating tragedy in the life of Christ. . . . 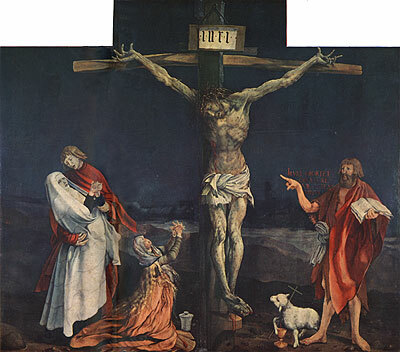 The Crucifixion is on the outermost wings, visible when the altarpiece is closed. . . .
Grünewald has shown the Cross as two roughhewn logs, still green, the crossbar drawn down by its dreadful weight. Christ has just expired in agony. Rigor mortis has set in; his fingers are frozen into a clutching position. The crown of thorns is a fearsome bunch of brambles, beneath which the face, contorted with pain, is greenish gray in death. The weight of the tormented body has drawn Christ's arms almost from their sockets. Arms, body, and legs are scarred and torn by the scourges and studded with thorns, as if Christ had been beaten by thorn switches. His feet are crushed together by a giant spike. Viscous, bright red blood drips from his wounds. Below the Cross on the right stands John the Baptist, a blood-red cloak thrown over his camel skin, and above his pointing art his words (John 3:30) appear: "He must increase, but I must decrease." The Lamb of God stands below, a chalice to his wounded breast. On the left Mary Magdalene, in a transport of grief, has thrown herself at the foot of the Cross, and John the Evangelist, also in blood red, holds the swooning, death-pale Virgin. This is one of the earliest nocturnal Crucifixions; over distant hills the sky shows greenish black. While the horror of the scene can be traced to an expressionist current in German popular art and literature, . . . the emphasis on the most physically repulsive details is traceable to the fact that this masterpiece was intended for a hospital church, where patients were brought before the altarpiece in order to realize that Christ understood their suffering because he had suffered as they did. Only thus can be explained that Christ's loincloth is made of the old torn linen used for bandages and that Mary Magdalene's jar of ointment appears in the painting, although it relates to a much earlier scene in Christ's life. The genius of Grünewald lies in his ability to raise mere horror to the level of high tragedy and so to unify deformed and broken shapes that the final composition is as beautiful as the greatest Italian work of the High Renaissance. The diagonals of the arms, for example, seem to erupt from the volcanic body as if in a gesture of self-immolation, linking the Cross to the inner angles of the T-shaped segments of the frame. These diagonals bind together all the other forces of the composition, sustaining by their positive strength the diagonals of the collapsing group at the left, of the gesture of John the Baptist, and of the distant hills. The final image is one of absolute unity and monumental grandeur. Once the doors are open (the joint runs next to Christ's right flank), the tones of greenish black and blood red are transformed to flame red, gold, and blue. The left panel is the Annunciation with the angel appearing to Mary in a chapel whose Gothic vaults and tracery are drawn and painted with such understanding that it is not hard to believe Master Mathis was a trained architect. . . . The central panel shows Mary caring for the Christ Child in the manner of a nurse for a patient before a richly carved and painted portico, symbolizing the Temple. . . . The cycle culminates in what is doubtless the most astonishing Resurrection in Christian art, shown in the right panel. Scot Borofsky is a painter and writer who lives in Brattleboro. He has been writing reviews and editing this column since April 2003.